Bamboodeck is mostly a pure natural and consists of 60% bamboo fiber, which gives very good properties of the product's climate and UV resistance. In addition, the choice of materials also reinforces to the natural character of the wood and creates a beautiful visual impact on your wooden deck or outdoor room. Bamboodeck is a quality product. Water resistant, dimensionally stable and maintenance free! 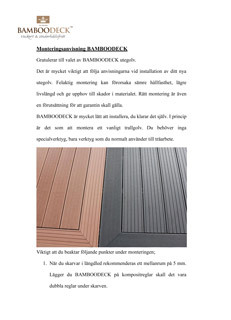 Bamboodeck is also suitable even to the conservatory - the glass-enclosed or open. You need no special tools to assemble Bamboodeck, just tools that you normally use to woodwork! 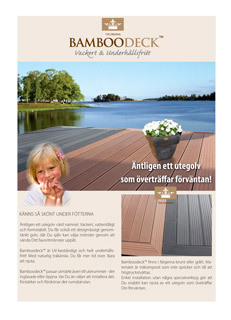 Additional information is available in Bamboodecks product documentation. Take note of the information on our website under the menu selections Products and Instructions, or from any of the downloadable .pdf document that are available in our Documentation .